China’s influence seen more positive than the US or Russia. China’s influence on the world is seen as positive by more people than is the case for the US or Russia, according to a new BBC World Service poll. In total, 48% of people polled in 22 countries said China’s role was mainly positive. Only 30% saw it as mainly negative. The majority of respondents were also positive about the [nominally] communist [but in fact capitalist] nation’s growing economic power. Even in neighbouring Asian countries, which have historically been suspicious of China’s dominance, opinions were relatively benign. An exception was Japan, where only 22% of people polled said China had a mainly positive influence. Most Japanese respondents expressed no opinion, with only 25% saying China’s role was negative. The survey of 22,953 people was conducted for the BBC World Service by the polling organisation GlobeScan, together with the Program on International Policy Attitudes (Pipa) at the University of Maryland. 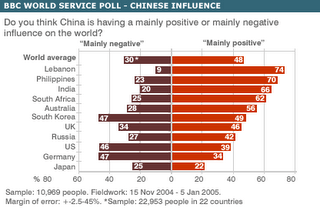 In 17 of the 22 nations polled, more people thought China had a positive influence than a negative influence. China came out favourably when the results were compared with similar questions looking at the global influence of Russia and the US. An average of 38% of respondents saw the US as having a positive influence, with just 36% saying the same for Russia. Indeed China, at 48%, is almost on a par with Great Britain, which scored 50%. China’s growing economic power is also seen as positive in the majority of nations polled. Even in Mexico – whose manufacturers are often in direct competition with those in China – 54% of people polled were positive about China’s economic rise. But China’s growing military might appears to be a less welcome aspect of its increasing global standing. Only 24% of respondents said a rise in China’s military power was a positive development, while 59% said it was negative. Among the most concerned nations were Australia, Japan and the US, as well as many European nations. The EU is currently considering lifting its embargo on arms sales to China. A BBC correspondent in Beijing, Tony Cheng, says China has rarely felt the need to look beyond its borders for reassurance in the past. But China is opening up. Widespread use of the internet and expansion of the mass media have brought the rest of the world into ordinary people’s homes for the first time. According to our correspondent, there is therefore an increasing concern about how the country is perceived, with Chinese citizens aware that progress will only come if they engage with the rest of the global community.